Medical grade plastic disposable measuring cups by SafeMed. Our medicine cups are designed for medicine dispensing in liquid, powder, and dry form, as well as pills. Our medicine cups are also often purchased by restaurants and bars for use in consumer beverages and alcoholic beverages, despite being designed and packaged for medication purposes. Our medicine cups come in completely sealed plastic sleeves of 100 cups stacked together. Each order of 100 cups will come in its own sealed plastic sleeve. 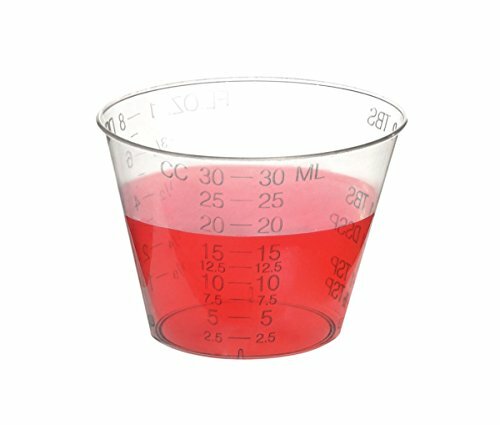 Our medicine cups have easy-to-read measurement markings in tablespoons, teaspoon, drams, cc's, milliliters and fluid ounces. These measuring cups measure 1 fluid ounce with a line before the brim to allow for detailed measuring and pouring and some degree of excess room beyond that. Our medicine cups are made from a translucent top medical grade polypropylene (plastic). SafeMed medicine cups are suitable for dispensing all forms of medication, liquid, powder and pills, and other forms of liquids. Our caregivers have come to us over the years asking for medicine cups in various quantities and sizes and we are glad to finally be able to offer our disposable graduated medicine cups in various quantities to you. You can choose from a single order of 100 medicine cups in one plastic sleeve, or a double order of 200 medicine cups in two plastic sleeves of 100 medicine cups each. For greater volume discount, you can also choose to purchase our medicine cups in a quantity of 400, which would give you four sleeves of 100 medicine cups. Or 600 medicine cups which would give you 6 sleeves of 100. Or our biggest offer is for 1000 medicine cups which would give you 10 sleeves of 100. The price gets better per sleeve as you purchase a higher volume of medicine cups. If you are unsatisfied with our top grade graduated disposable medicine cups for any reason whatsoever, we will accept a full refund from you at any point. SafeMed guarantees your 100% satisfaction. FDA APPROVED. If you have any questions about this product by SafeMed, contact us by completing and submitting the form below. If you are looking for a specif part number, please include it with your message.